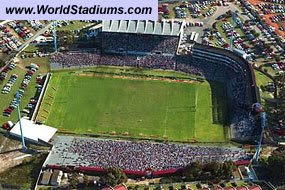 UPDATE on 2010-07-03: The last official rugby match was played on Saturday 3 July 2010 at the old "Boet". Future rugby matches will be played at the new Nelson Mandela Stadium. The "Boet" is to be demolished. The future fate of the locomotive and carriages are unknown at this time. Port Elizabeth is home to the Eastern Province Rugby Union which was founded in 1888, and boasts the internationally-recognized EPRFU Stadium (formerly known as Boet Erasmus Rugby Stadium) which has seating for approximately 34 000 spectators. 1998 photo: Geoff Pethick as published on sa-transport. 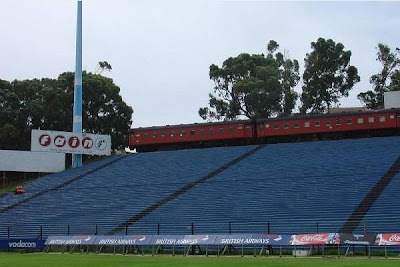 Located at 36 la Roche Drive, the Stadium has a unique feature in that it is the only one in the World which has a locomotive steam train placed on top of an open stand overlooking the field, which has been converted into a bar. 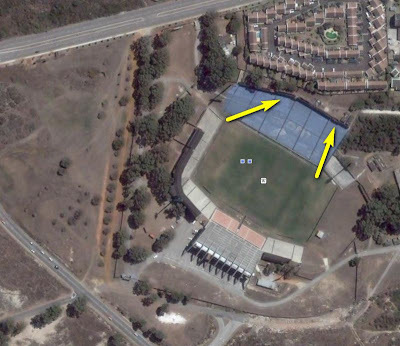 The stadium is used mostly for football and rugby union matches. "EPRFU" stands for Eastern Province Rugby Football Union, the company behind the stadium's historic primary tenants, the Mighty Elephants team in the Currie Cup. Presently the future of this stadium, after completion of the 2010 Nelson Mandela stadium, is not clear at all, and therefor with it, also the future of the "train on the top" has a question mark ...? This 4-8-2 locomotive is SAR Class 15AR ("R" indicates reboilered) engine no 1842. It was built in 1920 as works number 5958 by Beyer, Peacock & Co Ltd, Manchester, England. The original Class 15 was designed as a large mixed traffic locomotive for use where grades and curvature were not so severe as on the coastal sections. The improved Class 15A were continuously built between 1914 and 1922 by Beyer, Peacock and North British Locomotive Co. In total 119 of these fine locomotives were built. 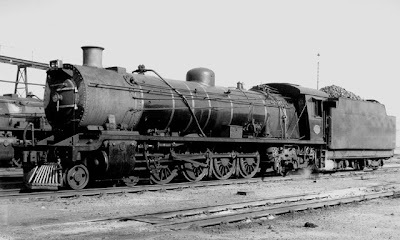 When later reboilered with a standard No 2A boiler both the Class 15 and 15A were reclassified as Class 15AR. In this form they worked in the eastern Transvaal, eastern Cape and the Orange Free State. During the 1960's many were transferred to the Cape Midlands where they were used mainly on the Port Elizabeth-Klipplaat section, as well as the Uitenhage suburban. They were gradually being withdrawn by the mid-1980's. A very near sister of this engine no 1842 is no 1840 stored at Klipplaat junction. a Sister locomotive when still in steam. Locomotive and coaches since scrapped.